Size: 25+/-" x 53 1/4"
Countertop Options: This countertop includes a faux live edge to mimic a real live edge countertop. Notched to fit at existing Post/Column. Routed on underside for customer installed support brackets. “The cabinets were designed and accessorized to maximize storage space and convenient access, including various sizes and depths of drawers, pull-out racks, tray dividers and a heavy-duty mixer base. 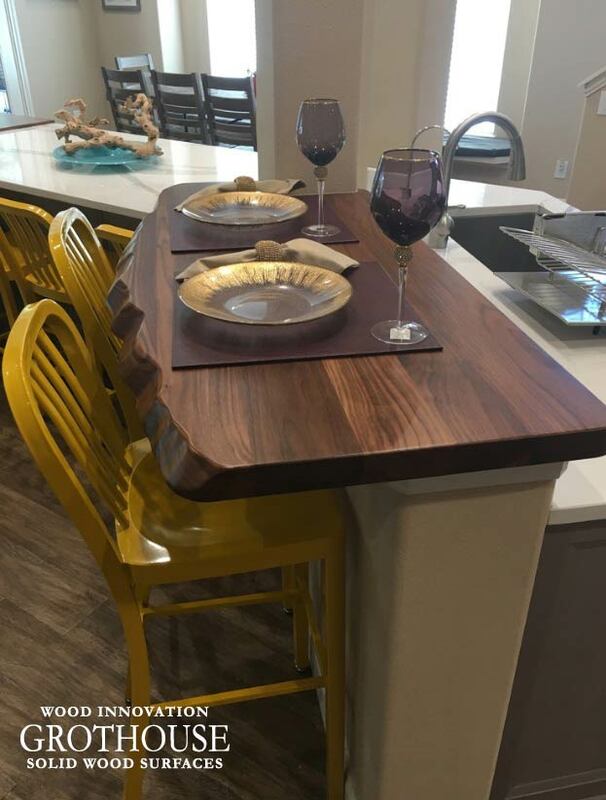 The bar top features a faux "live edge" by Grothouse and is supported by concealed steel countertop supports.” – Bay Area Kitchens. Professional photos by Benjamin Hill Photography, others by Randy Godeau of Bay Area Kitchens Read the designers blog here.